Ever laughed so hard your face actually looks like you're in pain and people start instinctively backing away from you like you're a crazy person? Well that's what I look like when I watch the TV show 'New Girl'. Things get a bit messy. I saw my first episode of this show while flying back to Melbourne from Washington DC and my poor husband was ready to smother me with my pillow if I didn't stop laughing out loud. Bless. 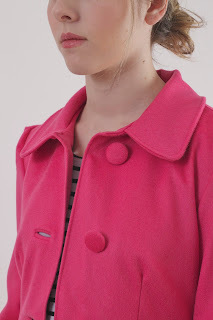 In one scene the lovely Jess played by Zooey Deschanel wears this striking hot pink coat and both my sister and I instantly fell in love with it, so I decided to make a similar version. I used Butterick Pattern 5145 in a size eight for my gorgeous sister Angeline. It was nice sewing something so small! I used a stunning wool/cashmere coating from Tessuti Fabrics for the shell of the coat which I purchased from the Melbourne store. I'm having serious face-fail in this photo. Dear. Lord. 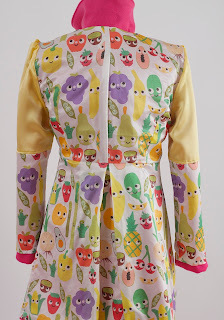 For the lining of this coat I used an awesome print that I found on spoon flower. 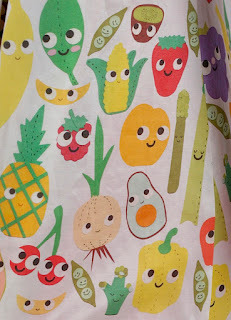 It's called 'Fruit and veggie madness fabric' by heidikenney I love her quirky designs, and they are perfect for the lining of a coat! I had it printed on a silk/cotton blend. 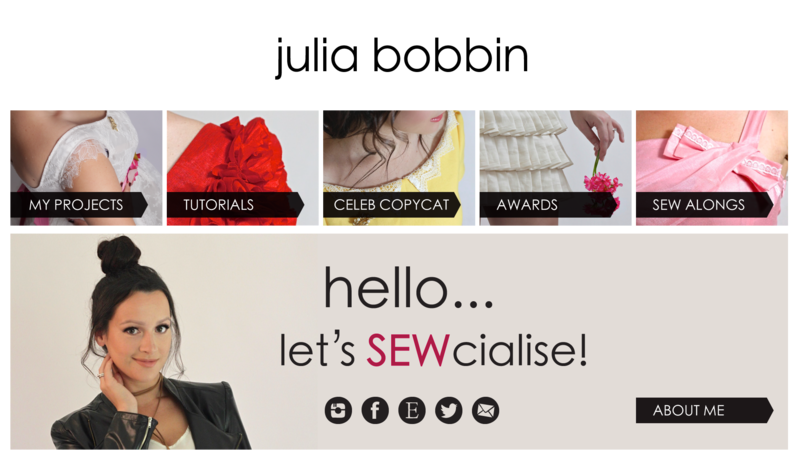 For those of you that are not familiar with Spoon Flower, it's an awesome website where you can upload your own fabric designs and have them printed on a number of different fabric types. You can also purchase other peoples designs, which is what I've done here. It's such an awesome idea! I made view C with the length of View B in a straight size 8. 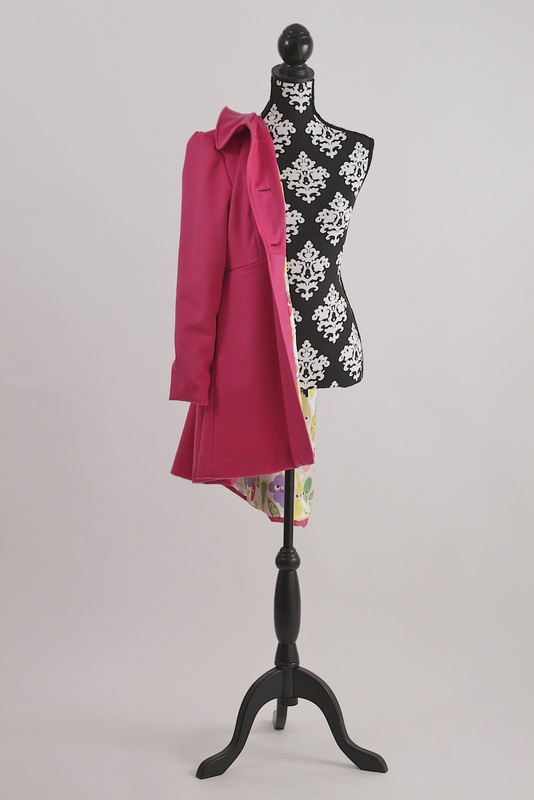 It closes with three button holes, has a peter pan collar, and a lovely box pleat in the back skirt of the coat. The coat is fully lined, so it looks pretty on the inside and out. I didn't have quite enough of the lining fabric for all the pieces, so I made the biggest part of the sleeve linings out of a yellow satin silk with the cuffs of the sleeve lining in the proper fabric. That way if the sleeves are rolled up you can still see the proper lining. 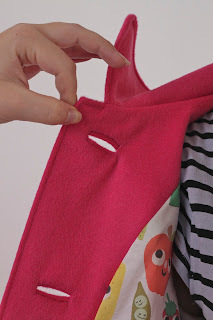 ... and the sneaky little side pockets. 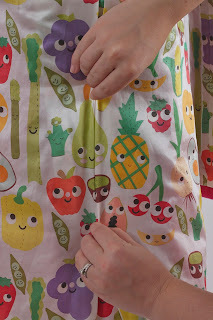 And just to be a bit of sewing nerd, look how the fruit on the lining matches up on the inside pleat! But before you start calling me a genius, I must admit that this was actually a complete FLUKE. A glorious, serendipitous accident. Instead of doing the regular machine buttons holes, I thought I'd challenge myself and try bound-button holes. I absolutely love the effect! It is a lot more time consuming, mainly because you have to make sure that you make everything absolutely the same so that you don't end up with uneven button holes, and also because it's my first time so I'm slow. Yes they take a lot longer but they are well worth the effort. They are neat, strong and I reckon they look so much nicer on a coat! Now-a-days you only would ever see these type of button holes on couture items in the stores. Infact, if you opened up your own closet you'd be hard pressed to find any purchased garment that didn't have a machine stitched button hole. Here's a comparison picture of a bound button hole and a machine button hole. I ordered my fabric covered buttons from Button Mania Yes I know I could do them my self, but this is so much easier for a time poor lass, and Kate from Button Mania is a perfectionist so you know you are going to get good quality. For extra movement in the lining I added a little pleat in the corner of the lining hem. This allows the lining to move up and down at the hem when you do. Stops potential tearing. 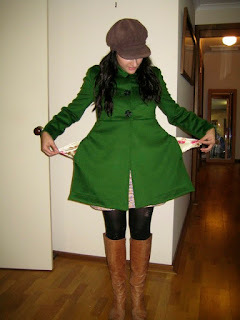 I love how this coat turned out and how well it fits my sister Angeline. It's definitely heating up in Australia, so my sister is going to have to wait a while before she can wear it. Melbourne is known for being a sea of black clothes, so I like the fact that this pink coat will definitely stand out in a crown of muted colours. Awesome coat. Shame the weather doesn't suit, but surely it will get plenty of wear. Thanks little Betty, I just wish I could fit into it too! Love it! You did an awesome job and it fits your sister perfectly! cuuuuute! 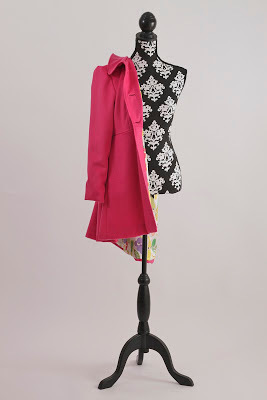 love the pink fabric, it suits the coat pattern really well. and the lining? awesome!!! i'm super into making outerwear right now. I know! I'm going through the same phase. I'm working on a blaze a the moment! That's one fabulous coat, and the lining is glorious. Love the geniusly serendipitous alignment on the inside pleat! Terrific job! I wish I had made the time to make me a winter cost this year...but I'm heading off to China next week to pick up my little darling! Can't wait to see what kind of creations you'll make for your own little one. Oh all the best Marsi, how wonderful! It's a beautiful coat! The lining looks cute with all the colours, and I love the collar. Gorgeous! Your sister is so lucky. 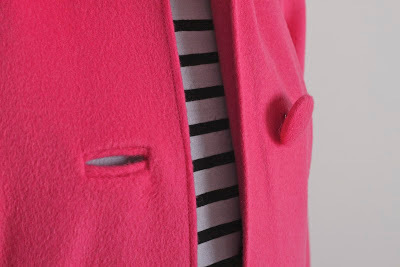 The combination of fabric and lining is great and your bound buttonholes are so neat! This coat is absolutely precious. I love the color and the silhouette. I may have to make one for myself. Oh my goodness!! 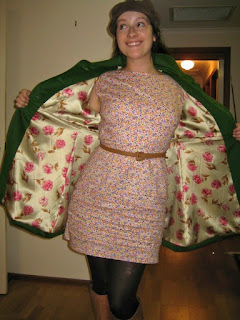 That coat is fantastic, and I love the lining fabric. Your sister is very lucky!! Lucky sis! It's so cute. Gorgeous coat Julia, and one lucky sister! The lining is absolutely gorgeous. Looks so beautiful and I'm tempted to try those buttonholes. Sometime. 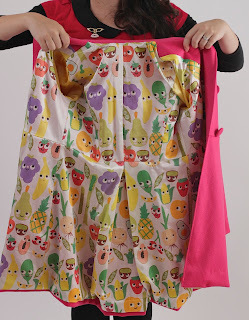 I looove the lining, such a cute print, and the back pleat is a really nice detail. Love this! It's so completely gorgeous! Your green version is way too cute, too! Lovely coat! It makes me want to run out and get that pattern. Lovely coat! I love how you did the lining .. so cute! That color is so yummy, and if someone ever made something for me using that lining, I probably would be forever grateful. Your sis is so cute in this coat, what a lucky girl! That is ridiculously cute!!! I love the colour, and the lining is perfect! It's stunning and I love, love, love the lining fabric you chose for it! That is one fabulous looking coat! very pretty! Freakin cute and ur sister is a natural at modelling! Beautiful coat, I may have to give it a try. Thanks for the inspiration! Beautiful coat. I'm a big fan of anything Zooey. And, I love that lining! 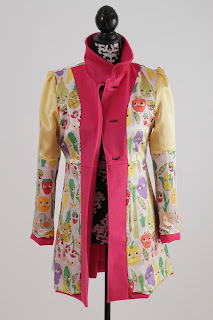 A beautiful coat which will add much needed colour to those grey Melbourne winter days. 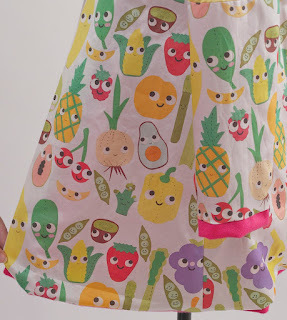 Thank you for the info about spoonflower. 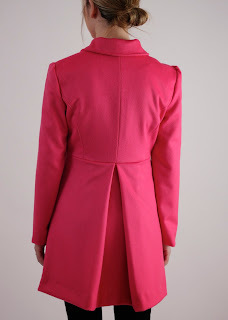 This is a stunning coat in a stunning colour! 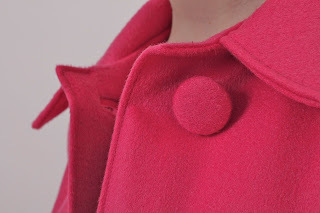 I've just finished sewing a pink coat as well and for me, that's the best colour colour in winter (I live in Spain and winter is just starting so plenty of coat-wearing coming up...so good), it's so cheerful. Your sister looks lovely in her new coat, it fits her perfectly and the colur compliments her skin so well. I can't tell you how much I love this! 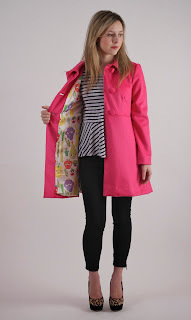 The bright pink colour and the super fun lining is just awesome! Plus anything New Girl inspired is a win with me! I have to admit I read this post yesterday but only had the chance to comment now, BUT I'VE BEEN THINKING OF THE COAT EVER SINCE. 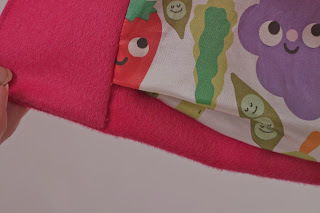 I'm still making jackets because it's not cold enough here in Israel, but once I get a few jackets out of the way I'M GOING OUT TO BUY PINK WOOL. I love the pattern it's incredibly cute and it matches your sister perfectly! you're both so pretty! Love it!! I love that tv show also, I saw that coat and I want to do it too. omg, that lining is to die for. i love a surprising lining! also, nice tip about the pleat at the lining hem. and i like that you did bound button holes. i never knew you could get someone else to make fabric covered buttons for you? how cool! pink is such a fun, unexpected color. i love it!! 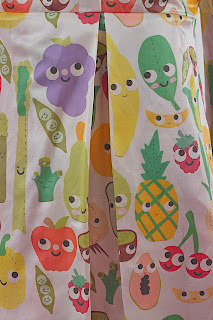 Is the spoonflower cotton/silk nice? Something suitable for dresses, tops or shirts? As the proud owner of a cape in exactly the same shade I can say wearing this will be a colourful wintertime treat! This looks absolutelyy stunning and well done on your first bound buttonholes- they look amazing! A seriously fabulous coat. 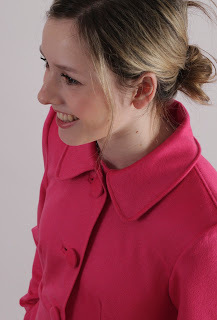 Love the colour, the fun lining and the perfection of your bound button holes. I have to agree with you about "New Girl". It is one of the very few shows that makes me laugh out loud to the point of tears...and I saw my first episode on a plane too! just gorgeous. if i were your sis, i would hope you stay preggers forever. For newest news you have to visit world wide web and on web I found this web site as a best website for latest updates. Love the colour. Yes, your sister will stand out amongst the funereal Melbourne winter dressers (I got weird looks the last time my green and purple coat made a trip down there from Sydney), but she'll stand out because she'll look so awesome. What's up mates, nice paragraph and pleasant arguments commented at this place, I am genuinely enjoying by these. I've been surfing online greater than 3 hours today, yet I never discovered any attention-grabbing article like yours. It is lovely value enough for me. Personally, if all webmasters and bloggers made good content material as you probably did, the internet will be much more useful than ever before. on. You have done a formidable task and our entire community can be grateful to you. I see from McCall's website that this pattern isn't in print/out of stock. Any ideas on where to find a duplicate/similar pattern?